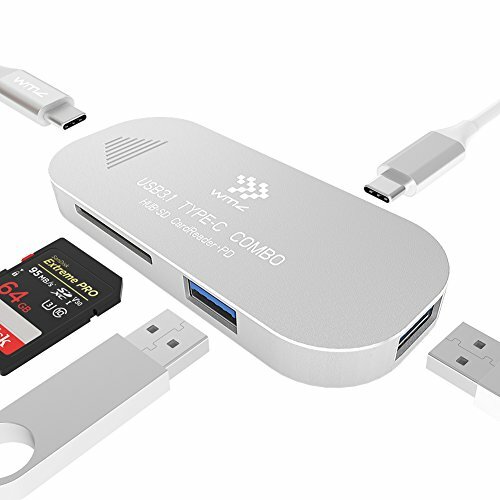 Multi port usb hub designed for the latest generation of computers and smart devices that have USB-C ports. Including new 12" MacBook, MacBook Pro 13''/15'', Google Chromebook 2016, Huawei Macbook 2016 as well as other USB Type-C devices. Great performance on compatibility and stability by using the latest control chip with high speed, provide full function for SD / TF / USB 3.0 / TYPE-C device. 1. Input: Reversible USB 3.1 Type - C port. 2. Output: 2*USB 3.0 ports, 1*Type - C port, 1*SD card reader slot. 3. Compatible with USB 1.0 / 2.0 / 3.0. 4. Type C port support PD function with 5-20V/1.5-3A, charge & data sync. 5. Compliant with USB 3.1 specification. 6. Working with SD / SDHC / SDXC / miniSD / microSD (T - Flash) card, 2TB max high-capacity card. 7. Compatible with all devices with OTG function. 8. Working with system of Windows XP 7/8/8. 1/10, Mac OSX v10.7. 【PD Power Delivery】USB C Hub Power Delivery for New 12" MacBook, MacBook Pro 13"/15", Google Chromebook 2016, Huawei Macbook 2016 and other USB-C devices. Type C port also support PD function charging and data sync. 【SD & TF Card Readers】Multiport USB C Adapter compatible with SD, SDHC, SDXC, miniSD, microSD (T - Flash) card, 2TB max high-capacity card. Enable you to easily access files from an SD card and a TF card on your USB-C laptop. 【High Speed Data Transfer】Super Speed USB Transfer, transfer data with a super fast speed by using USB 3.0 technology, it can up to 5Gbps. Ideal for Flash Driver, Keyboard, Mouse, Digital Camera, Speaker, Phone, Hard Disk and other equipment. 【Plug & play】No need to install any software, drivers, or any complicated process. Just plug it into your USB-C laptop's Type-C port. Connecting and transferring data between devices and storage media has never been easier. 【Lightweight & Slim】Macbook Pro Type C Hub appearance with high quality aluminum alloy materials, heat dissipation faster, qualitative feeling. Super slim and light design is easily portable and saves desktop space. If you have any questions about this product by WMZ, contact us by completing and submitting the form below. If you are looking for a specif part number, please include it with your message.